The Columbia River Roundtable exists to promote a community of the Columbia by working together respectfully and networking across the international boundary. Participants in the River Roundtable include citizens, businesses, and other organizations in Canada and the United States who support modernizing the U.S. – Canada Columbia River Treaty, and who agree to a Statement of Principles. The Columbia River is one of the most remarkable rivers on earth, and draws water from a basin about the size of France. When, in the early 1800s, explorers Lewis & Clark and David Thompson first stepped into the watershed, they found a river of life. 16 – 40 million salmon returned each year to natal streams in the Basin’s forests and deserts, renewing a great cycle of life. This was a place where indigenous people lived as they had from time immemorial, depending on salmon and the river. In two centuries, the blink of an eye, profound changes have occurred in the Columbia River Basin. Among those changes: dams, transforming one of the earth’s richest salmon rivers into the largest integrated hydropower system on earth. Benefits have come with wrenching costs to people in the Basin, fish and wildlife, and the river. In 1846 EuroAmericans signed the Treaty of Oregon between Great Britain and the United States, drawing the international boundary as a straight line at the 49th parallel. That decision has had profound impacts on indigenous families, while challenging Canada and the United States to work together to promote the Common Good for the people of the Basin and the Columbia River. In 1964, Canada and the United States ratified the Columbia River Treaty. Negotiators for both nations failed to consult with indigenous people, and indeed the people of the Basin generally. The Treaty contains only two purposes: hydropower and flood control. New dams built pursuant to the Columbia River Treaty forced thousands of people from their homes and destroyed habitat for wildlife and fish. Many of the Treaty’s benefits are exported outside the Basin in the form of hydropower. Within the Basin, protection for real estate development of floodplains for the Portland/Vancouver areas came at a terrible cost: damming and permanently flooding vast areas of the Columbia River Basin in both nations. In 2024, the current Treaty will flip flood-risk management responsibilities from Canadian reservoirs to dams and reservoirs on the United States side of the Basin. That looming change has encouraged both nations to revisit the Treaty. 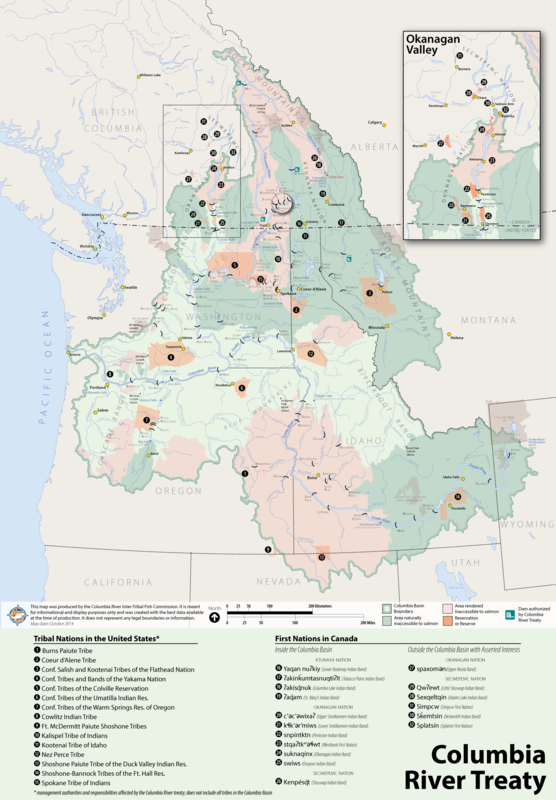 15 Tribes of the Columbia Basin coalesced behind a Common Views document. Conservation organizations, on behalf of their members and other citizens, have also engaged in this work to bring about badly needed Treaty reforms in a time of climate change. Out of this effort have emerged the American Treaty Caucus and the Canadian Treaty Caucus, working together through the Round Table. The Roundtable convened in Nelson, British Columbia, in November 2013 and has since continued a coordinating and networking function. Participants in the River Roundtable seek changes to the Treaty – specifically adding a third treaty purpose: Ecosystem Function. The River Roundtable regularly invites representatives from the Columbia Basin tribes and First Nations to provide information and insight on the challenges facing citizens as we seek to modernize the Treaty. The River Roundtable also helps to support work underway on flood risk management, climate change, ethics, the arts, and more broadly building a community of the Columbia that transcends the straight-line boundary drawn across the upper basin in the 1800s.